One chilly morning we drove up to North Shore, Massachusetts, to meet with our officiant, Mr. John Cena Sr. He walked in the door and immediately greeted us before walking up to the counter in the coffee shop to pay for every single person’s order in line behind him. This is the kind of man Mr. Cena is, and exactly what we were looking for in an officiant: charming and kind. He’s also pretty hilarious. Most people know him as John Cena, the “wrestler’s dad,” as did Kyle and I until that day. We talked for more than two hours, going over different ceremony ideas as well as chatting on a personal level. You can tell he truly loves what he does. I don’t know if people typically get that close and comfortable with their wedding officiant, but we had an awesome experience with him and cannot wait for him to marry us. 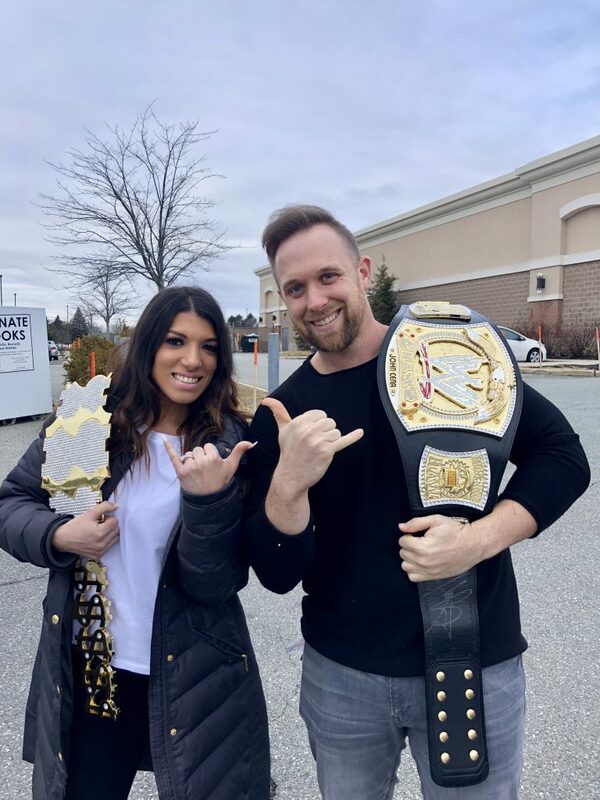 After our meeting we went outside and snapped a picture with John Cena’s championship belts. So many more fun surprises are in store with him. Chloe was in heaven when we went to find her dress. 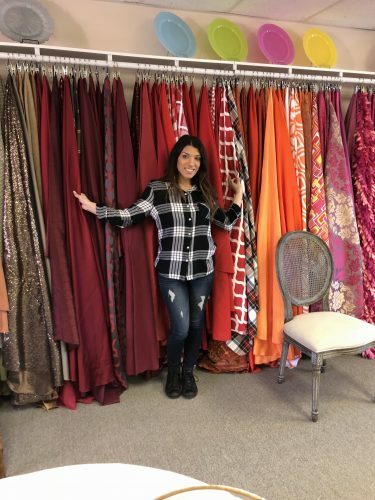 She tried on about ten different styles and of course loved every one. I on the other hand, fell in love with just one. I wanted her dress to reflect mine without it being exactly the same. I think we conquered that goal with her white princess-style dress and pink flower details. She can’t wait for everyone to see the one we chose. I had way too much fun shopping for my decor at PEAK Event Services. I wanted to keep the colors simple and elegant, but also want everything to sparkle and shine during the reception. I chose a white, lightly-patterned tablecloth with a slight silver shimmer. 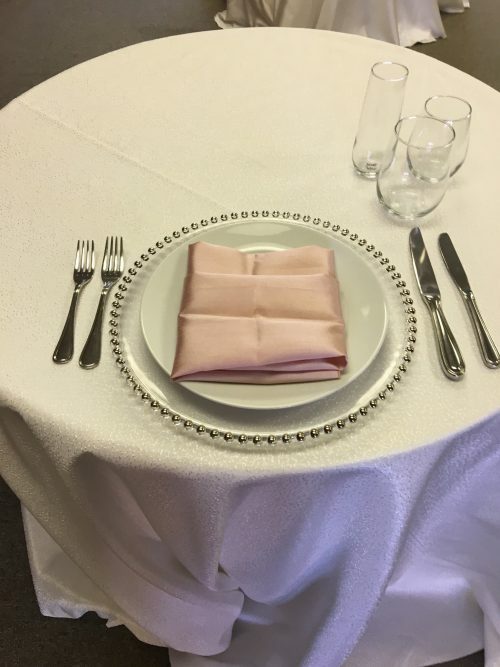 I brought in a modern feel with the clear silver beaded charger plate and incorporated blush pink napkins. We picked out modern furniture to fill the spaces in Belle Mer’s Island House and chose a farm table for the sweetheart table. I was really digging the rustic vibe with the farmhouse table! The flowers and centerpieces will bring in additional colors and complete the look of the room. I can’t wait to see it all come together. My wedding shower is happening in March and my mother and sister are doing an amazing job of keeping me informed, without giving away too much detail. I know we’re having brunch at one of the best spots in Providence. Guess I’ll just have to wait and see! 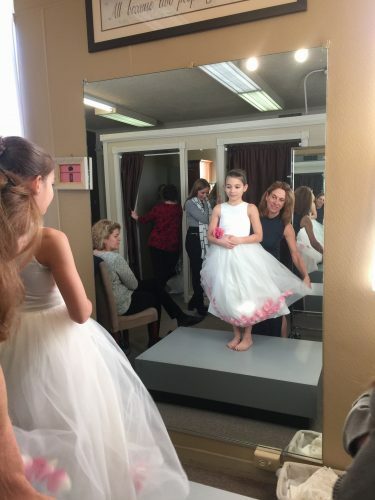 My first dress fitting, bridal shower and invitations.